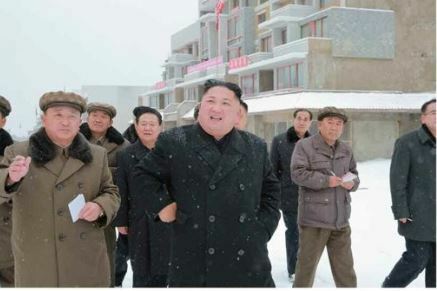 The number of North Korean leader Kim Jong-un's public appearances increased in 2018, mainly in the fields of economy and external affairs amid rapprochement on the Korean Peninsula, government data showed Friday. Kim appeared in public 98 times last year, up 4.3 percent from 94 in 2017, marking the first time in five years for the number to rise, according to the data compiled by the unification ministry. The tally had been decreasing every year since reaching its peak with 212 in 2013. Of the total, activities related to the economy accounted for the largest portion with 41.8 percent, up from the previous year when it accounted for 27.7 percent of the total. The proportion of activities related to external affairs and other fields also surged from 1 percent to 28.5 percent during the cited period, the data showed. Meanwhile, the proportion of Kim's military-related public appearances shrank from 44.7 percent to 8.2 percent in line with Pyongyang's peace overtures. Last year, the North's leader held three summits with South Korean President Moon Jae-in and his first-ever meeting with US. President Donald Trump and expressed his commitment to complete denuclearization of the peninsula.